He, and a few others, set out to show that you could. (You usually get Sundays off for good behaviour, but it depends on the calendar, some years April has 5 Sundays, so you have to work one of them. Thems the breaks). The challenge took off, and now, 9th time around, there are still people who haven’t learned better, joined by newcomers who think that this looks like a jolly idea… Some people write on the day, prompted only by the letter. Others, spend a lot of time in preparation, following an additional theme, prompted by their interests. I fall somewhere between the two camps. I’d like to be all prepared, every post written in advance, falling into place like a well-oiled domino, giving me lots of time to see what everybody else is up to. In practice, I’m usually putting together the last few posts in the sequence at the last minute like some kind of pantser. (Some of my best friends are pantsers, they’re nice people, really, it’s just I’d prefer to be more prepared). I really should know better. In 2016 I wrote 26 posts on How To Write a Thesis. I was able to do this with the minimum of cheating (some letters are harder than others, but Zeitgeist was completely justifiable – go see for yourself. Yoda may have been more tenuous…). @Emmawelds, was kind enough to say that she was going to go and re-read the series in order to prepare for writing her thesis, so hopefully I did something right/write. In 2017, I came back for more punishment for a series about the use of Materials in Literature and Film. Oops. This was meant to be a quick post to say that I’m not doing AprilA2Z this year. No, not really. I am doing it, but for me AprilA2Z is all about breaking new ground, so this year, I’ll be doing it over at Fiction Can Be Fun, the writing project that I share with @DebsDespatches. We’re sharing the writing, which will be…interesting…but that adds some complexities and…still what are you still doing here? Get over there and see what we’ve got planned! Hi Hilary, good to hear from you! Yes, a new writing adventure. It’s going ok so far, but I think we’d both like to have a few more posts in the bag… the year is disappearing far too quickly! 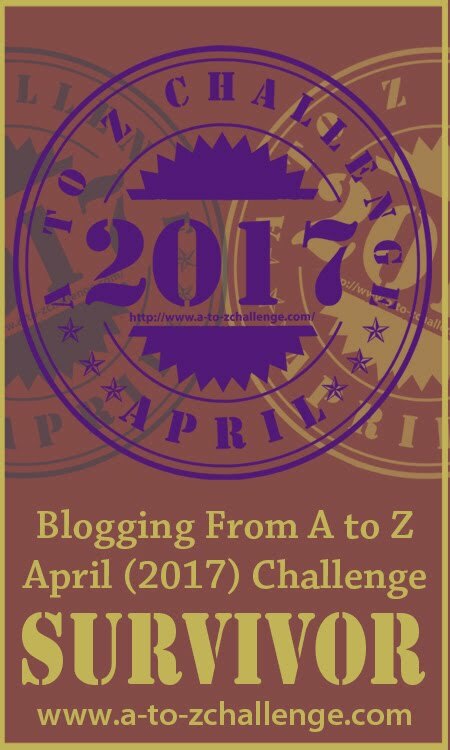 Cool idea to share the burden of doing the A to Z Challenge. Am off to see what you two have cooked up. Yeah, I did a “quick” post for this week apologising for not having much to say and then … erm … rambled on somewhat. But I did throw in some pretty pictures as some form of apology.